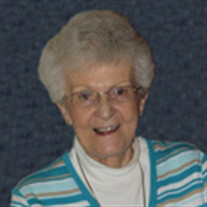 Obituary for Arlene Mae Doot | Langeland Family Funeral Homes, Inc.
Arlene went home to be with her Lord and Savior on Wednesday morning, March 14, 2018. She was born July 10, 1934 in Grand Rapids, the daughter of the late Cornelius 'Casey' and Mary (VandenBand) Klomp and was a 1953 graduate of Godwin Heights High School. On July 9, 1954, she was united in marriage to John E. Doot Sr, who preceded her in death on May 5, 2013. Arlene had a strong faith and a great love for the Lord and her church, Hope Reformed. She was active in sports throughout her school years and enjoyed being outdoors, camping and fishing with friends and family. Arlene loved music. She played the accordion and sang with special friends at numerous churches as well as being in her church choir. Most of all, she loved her family. Arlene was a loving devoted wife, mother, grandmother and great-grandmother. Surviving are her three children, John Jr. (Carmen) Doot of Hudsonville, Ann (Doug) Charles of Mattawan and Ron (Jody Dorothy) Doot of Plainwell; six grandchildren; eleven great-grandchildren; and brother: Roger (Cindy) Klomp. Friends may visit with Arlene's family from 2-4 PM on Sunday, March 18, and 9-10 AM on Monday, March 19 at Langeland Family Funeral Homes, Westside Chapel, 3926 S. 9th Street, Kalamazoo, where a funeral service celebrating Arlene's life will be begin at 10:00 AM. Interment will follow the luncheon at Ft. Custer National Cemetery, Augusta. Memorial contributions may be directed to Hospice Care of Southwest Michigan or Kalamazoo Gospel Mission.